Many people would love to know how to be more confident in social situations. If you struggle to meet and make new friends it can be very awkward not knowing how to act when you’re in a group. Sometimes when you’re nervous your demeanour can be misinterpreted and people might misjudge you. After all, we can’t see inside another person’s head – all we have to go by is their body language. Your body language could be letting you down and causing you to come across as arrogant, disinterested or stand-offish. It’s hard to be outgoing when you worry so terribly about others think. 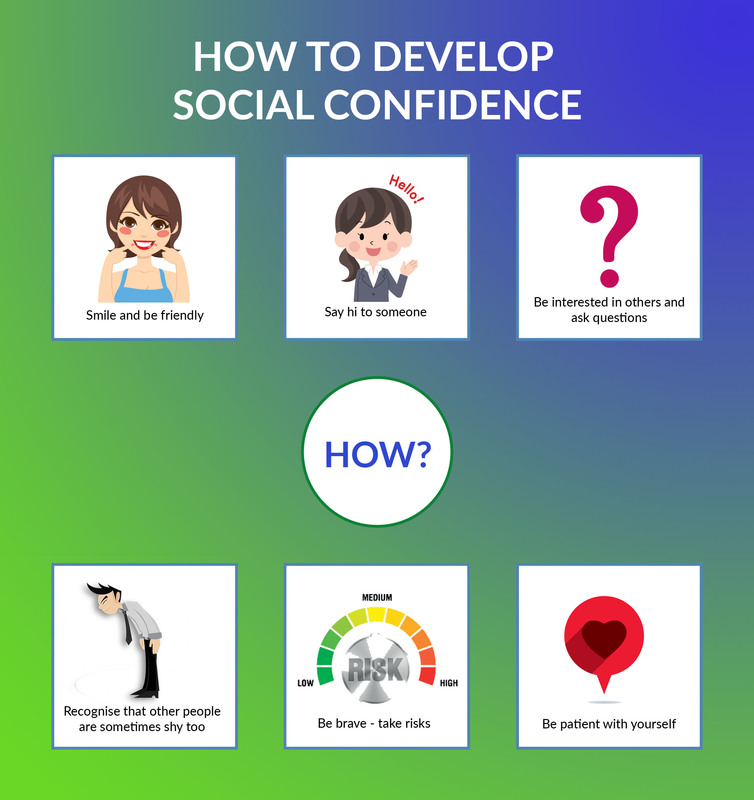 But making friends requires a leap of faith, so here are some tips for gaining social confidence. It sounds simple and it is. People are more likely to want to interact with you if you open your heart and make yourself approachable. When you’re feeling nervous it can be hard not to project an air of discomfort, and your body language may be scaring people off. To solve this problem, try practising an open, friendly posture in front of the mirror at home. With some practice you will get a feel for the kinds of gestures and body language that make you appear more open and friendly. Smile and let people know that you want to connect with them. If you are afraid people won’t like you, remember that most people are in the same boat as you – they want to be liked and accepted, just like you. Many shy people clam up when they’re with new people. You might get a kind of performance anxiety when others attempt to make conversation with you, where your mind goes completely blank. Find some common ground and before you know it you’ll be chatting away like you’ve known this person all your life. Like everything worth doing, this takes practice; but if you stick at it the rewards are bountiful. But I’m TERRIFIED Of Being Rejected…. Join the club! It’s part of human nature to want to belong. This is a survival instinct that has been with us since the dawn of time. But you can train your mind so that while still wanting to be accepted (as we all do), you don’t NEED it. That way the stakes aren’t as high and you’re more likely to relax. Ironically the less approval you need from others, the more approval you tend to get! If prospect of being rejected stops you from socialising you might want to try my fear of rejection hypnosis MP3. If you struggle with confidence, then this is probably a foreign concept – in fact you might want to be anybody else BUT you. But the truth is, when you’re being yourself other people are naturally drawn to you. When you’re trying to put on a show, people sense it. They instinctively know when you’re not being true to yourself and as a result they are less inclined to trust you or want to connect with you. There is nobody else quite like you – so you may as well own your own personality. When you show that you are comfortable with who you are, other people will reflect this back to you. They will want to get to know you. If you need a little help and you would like to learn how to be more confident socially try my Social Phobia hypnosis MP3. On the other hand, if you would like one-on-one help with social confidence visit my Melbourne Hypnotherapy contact page and give me a bell.